Another successful SEMA Show in the books. My tenth visit to the largest automotive aftermarket show in Vegas, SEMA is a trade only show filled with thousands of competition cars and car builds, and this year, an insane 140,000 people. I have over 90 images of the show on my Instagram feed, which you can view here. 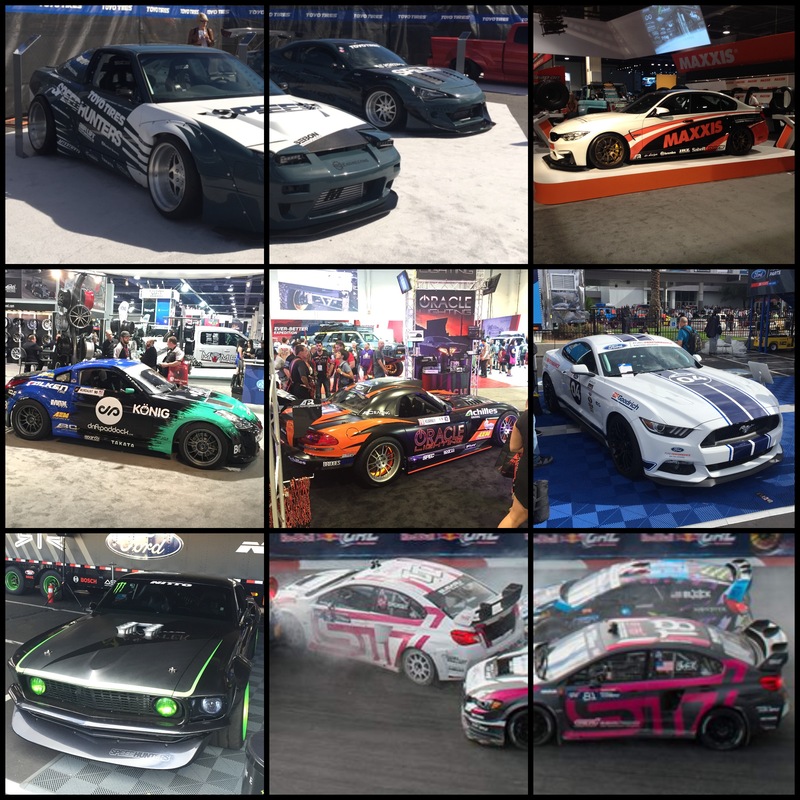 A quick overview of my cars at SEMA 2015…. 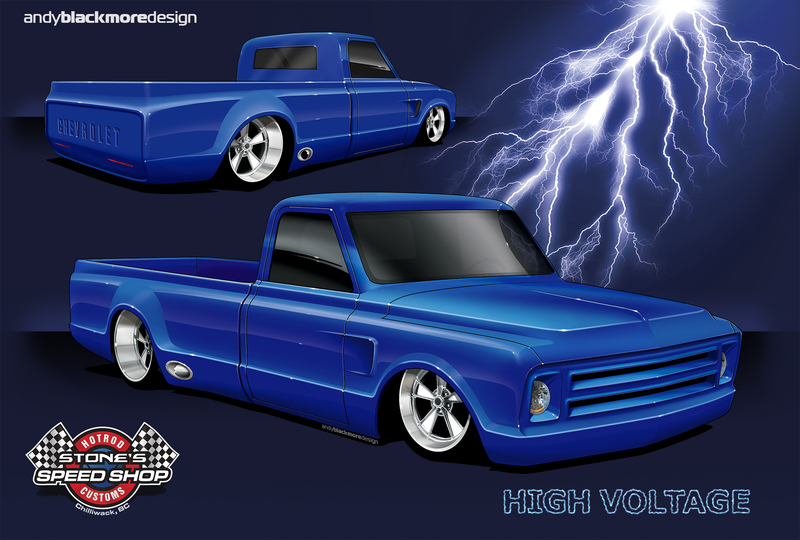 This cool low riding Chevy C-10 truck is currently in build and just armed with a few Facebook images and a spec, was able to create this rendering which will be shown alongside the in progress build at the British Columbia Classic and Custom Car Show in Abbotsford 17-19 April. Stone’s Speed Shop owner,Kevin Stone, is also locally known for some amazing metal sculptures (see below), a real artist and craftsman. 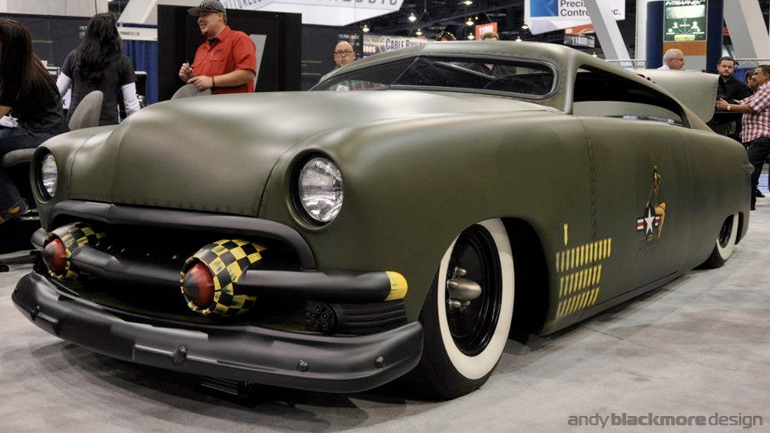 I have posted a number of images from SEMA on my Facebook Fan Page (don’t forget to ‘Like’). Most of the OEM’s have been shown extensively on the big news and Blog sites such as Autoblog.com, Jalopnik.com and Speedhunters.com so I have focused on some of the other cool machines. Andy Blackmore Designed vehicles, once again triumphed in the 2011 Speedhunters Car of the Year Awards. The Ford Mustang RTR-X won the Muscle Machine of the Year, while the top 3 Pro-Drift Cars all had Andy Blackmore Design vehicle liveries, Matt Powers Nissan S14, Darren McNamara’s Toyota AE86 and Mad Mike’s Mazda RX-7, whose design is a development by Mad Mike of the Mazda RX-8 livery Andy designed in 2010. 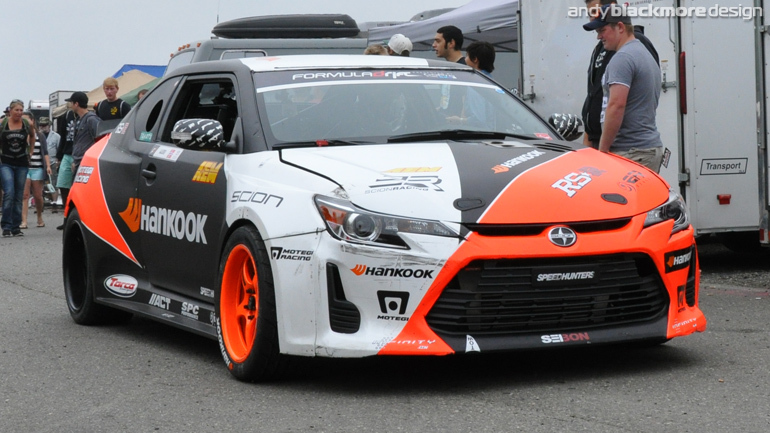 The RX-8 won Formula Drift Best Looking Car of the Year and Speedhunter’s Pro-Drift car of the Year in 2010. Mustang RTR-X ‘Showstopper’ at SEMA 2010. The Team Need for Speed Mustang RTR-X which Andy designed with Vaughn Gittin Jr was unveiled earlier this week on the Ford Stand at the SEMA Show. The car looks stunning in the flesh. Twins Turbo and Steen Chassis did an amazing job bring Andy and Jr’s vision to reality. AutoGuide.com said it was “Definitive showstopper”. 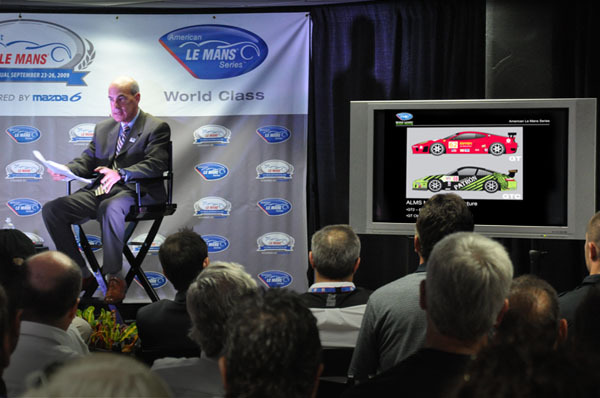 The launch took place immediately after the Ford press conference. There were more people waiting by the covered RTR-X than at the main conference. Andy has been working with Formula Drift race winner, Vaughn Gittin Jr, on this exciting new build over the past few months. The build is based off a 1969 Mustang Boss and will be built from a new Chassis, from scratch. The car will make its debut at SEMA 2010, but you can follow the entire build process including livery voting here at Speedhunters.com. The outline of the project was presented to Speedhunters earlier this month before a livery vote, showing a variety of designs. The Speedhunters voted in their thousands, literally and luckily our favourite design won. A Dark grey metallic base with Matt Grey elements and Sonic Green highlights. The Green is sure to be controversial, but the last thing we want to create is a bland design. This needs to stand out. The original post on Speedhunters can be viewed here, while a summary of the build and design can be read here, on Andy Blackmore Design. Thanks to Vaughn and Rod Chong for the opportunity to work on this unique project. 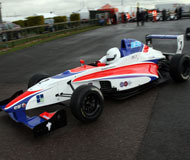 Podium finishes marked the debut of the new Formula Renault livery for CRS Racing at Thruxton. 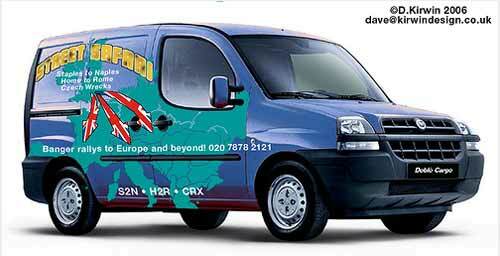 The livery was designed before the car had been launched, using CAD screengrabs which gave Andy more of a challenge. The team wanted a different livery to the Ferrari and have ‘coloured pockets’ for different sponsors on multiple cars. Team Need for Speed launched across multiple disciplines. 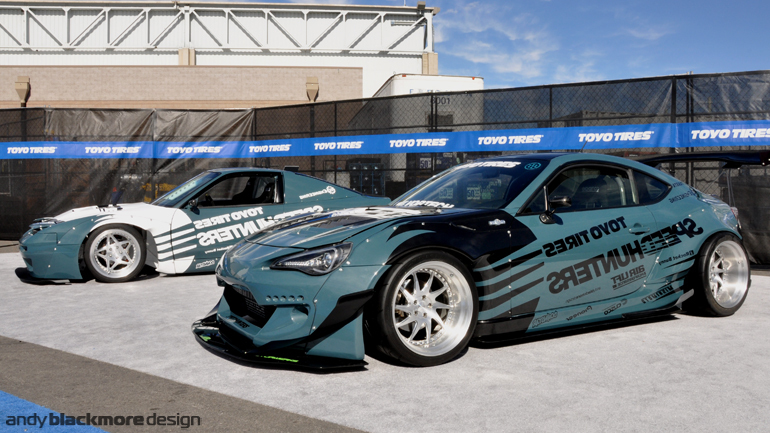 Andy has been working on a new livery for EA’s Need for Speed race team which will compete in multiple disciplines including FiA GT3 and Formula Drift. The asymmetric livery has been designed to stand out from the crowd but also be personalized for each ride. 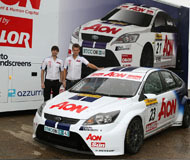 Team Aon, run by Arena International, a client of Andy Blackmore Design for the past 17 years, launched their new 2010 Ford Focus at the BTCC media day. The livery has been updated with new sponsors including Calor. Andy designed all the race clothing, pit panels and truck graphics for the 2010 season. A long job! 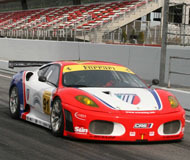 The 2010 CRS racing Ferrari F430 has recently been testing in preparation for its competition debut in April. See more images here. Andy has designed a Legend Fires livery for John Stones new Skoda Fabia WRC which will complete in the British Tarmac Rally Championship. The livery is based around a scaled up version of the Legend Fires logo, with the colours tweaked for maximum exposure. 2009 American Le Mans Series Yearbook now available!!! Andy recently completed a new livery design for CRS Racing, one of the top Ferrari GT teams in the world. 2010 will see CRS move into the Le Mans Series, complete with this new livery which has been designed to improve branding placement and opportunities. 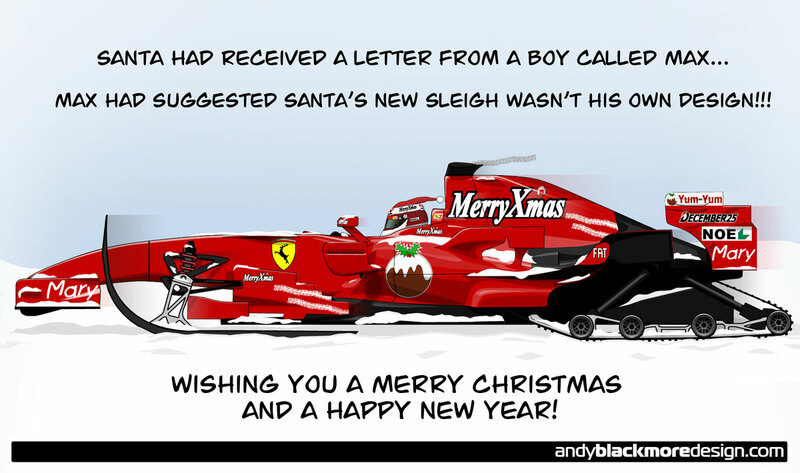 As is now tradition, the Andy Blackmore Design Christmas Card has now been released, Merry Christmas and a Happy, successful 2010 to clients, past, present and future. Click on the image to view the card. 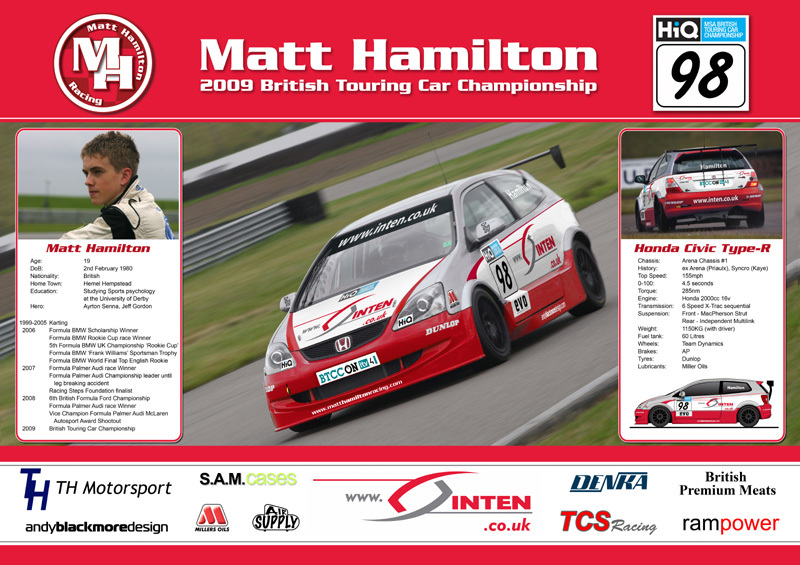 A Hero Poster was recently produced for new BTCC star, Matt Hamilton. Using the Photoshopped images of his, then, to be completed Honda Civic, the poster was designed and laid out by Andy and produced double sided A2 for fans at the track. Click on the image for a larger version. Contact Andy now it you want a stunning Hero Card or Poster produced for 2010. The Mazda Raceway Laguna Seca race track commissioned Andy to supply car images for their own Spotter Guide, which was available at the circuit. Produced by designer J.R.Martinez, Andy supplied all the cars for the guide. If you are interested in using my 2010 cars for your own circuit or sponsor Spotter Guide, please contact Andy directly. As an offshoot of Andy’s writing on Speedhunters.com, Andy produced two articles for Need for Speed’s new website in October as the video game was sponsoring #92 BMW M3 GT2 at Petit Le Mans. Andy’s first article was an insight of ABD client, RadioLeMans.com while the second article was a review of the race, centered around the #92 car. 2009 Spotter Guides – A huge success! Scott Atherton, CEO of the American Le Mans Series presented his annual ‘State of the Series’ address on Friday of the Petit Le Mans weekend. The presentation included two slides showing Andy’s artwork from the Spotter Guide series. As a client of ABD, the ALMS uses Andy’s artwork for Spotter Guides and presentations. 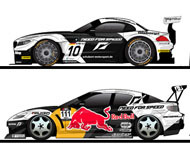 Livery Design Artwork is available here, in our livery section. 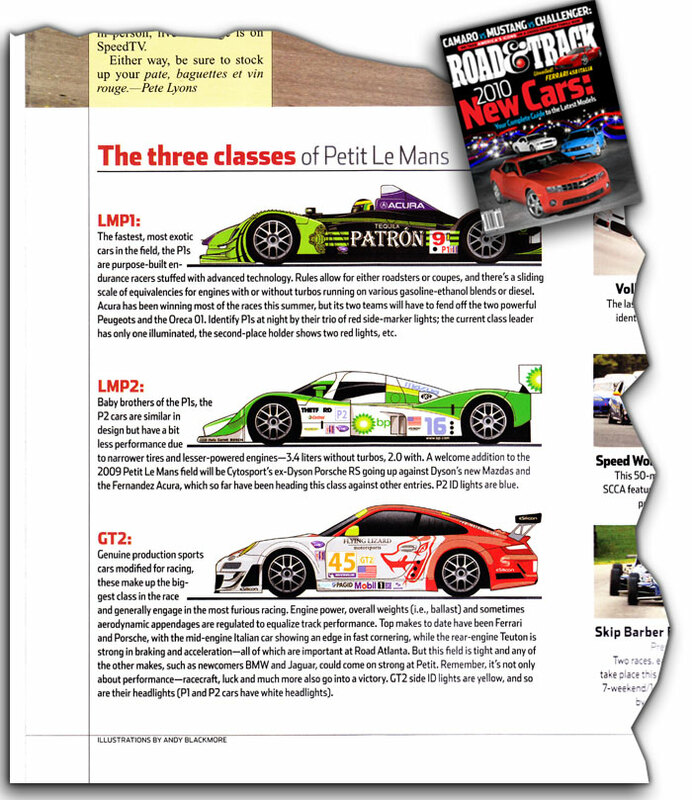 Andy was recently commissioned by Road and Track magazine to produce three images showing the class structure in the American Le Mans Series. The series put Road & Track in touch with Andy directly. Click here for a scan of the image or pick up a copy of the October issue of Road & Track Magazine across North America. Andy is working with Marshall Pruett on the new GrandTouring Prototype.com website. The website showcases golden era of North American Motorsport, the IMSA GTP championship in the 80’s and 90’s. Andy is producing a number of graphic assets including website branding, stickers and t-shirts. You will be stuck in this site for hours. Lots of awesome videos to watch! Andy recently commissioned by Marshall Pruett of SpeedTV.com to produce this piece as a print which will be given to Allan McNish and David Brabham, in recognition of being voted the Two Fastest Sportscar Drivers, by fellow drivers, journalists and team owners. The image also appeared on Allan’s official website. The 2009 24 Heures du Mans Spotter Guide was a major success. Over 31,000 hits across four websites hosting the guide in a six day period. Radio Le Mans, Eurosport and Speed TV commentary teams all used the guides! If you would like to sponsor the guide for 2010 and capture a dedicated motorsport audience please contact Andy today. Branded versions of guides are also available. Andy recently wrote his first article for SpeedTV.com. The article reviews the liveries of the 2009 Formula One teams and explains to the Speed TV audience challenges faced by livery designers. BTCC Arena Ford Focus bodykit and livery design. 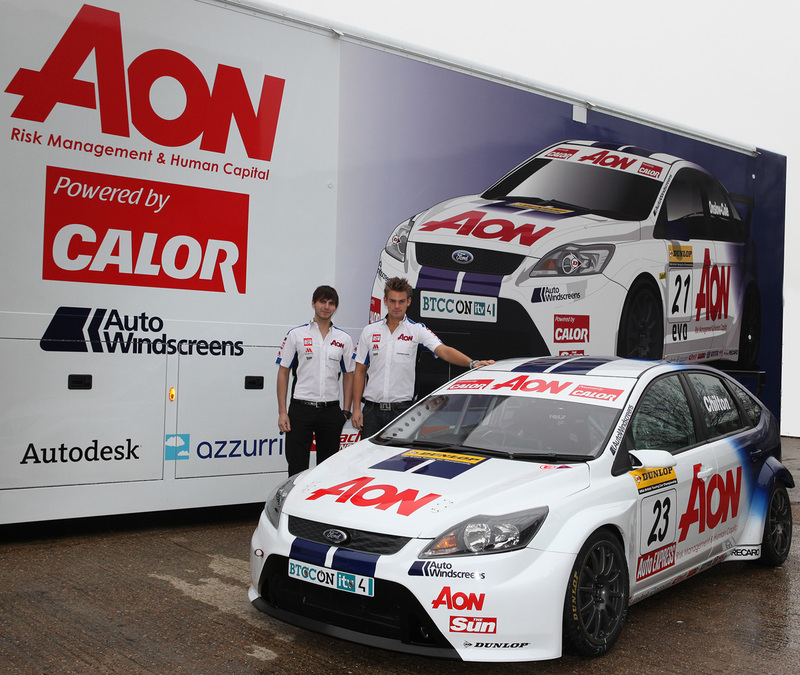 Andy was commissioned to create the car, truck livery and various presentation artworks for the new Arena Motorsport Ford Focus, which Tom Chilton and Alan Morrison will campaign in the 2009 British Touring Car Championship. The livery is loosely based on the Ford WTCC design from 2004. Andy has produced the ‘Grid’ graphics ITV’s coverage of the 2009 BTCC season. Andy’s graphics were first used in 2008. The images are based of the BTCC Spotters Guide which you can download (see below). Andy has recently been working with TPP Publishing, providing car illustrations of every car raced in the 2008 American Le Mans Series. Based on the Spotter Guide artwork, the illustrations compliment a year in review, technical review and team-by-team guide. Team / Sponsor branded Spotter Guides available. Team branded Spotter Guides can provide ViP’s, fans and team guests with useful race entry information on the series they are involved with. 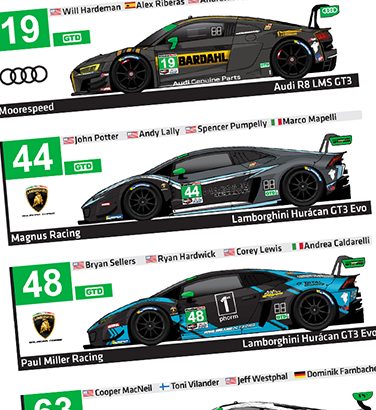 This is a great cost-effective way to spread your brand via a unique header and when required, featured cars such as the Team Dynamics Guide shown here. Andy was recently commissioned to produce a livery for Patrick Soderland’s new Porsche, which will be running in selected Endurance races in 2009. Base colour had to remain white, due to time constraints. 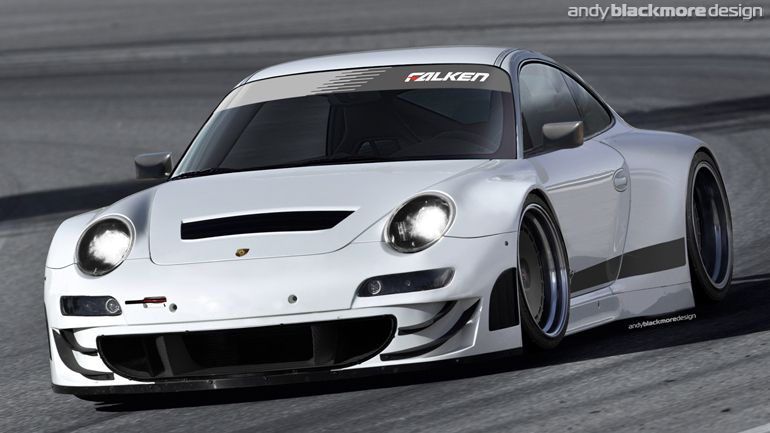 The clean livery is loosely based on NFS ‘Undercover’ cover car, which Andy also assisted in designing (see below). You can view images and report at Speedhunters.com, by clicking the image. Need for Speed.com and Speedhunters.com recently carried an interview with Andy on his design for the modified Porsche 997 GT2 car which features on the cover of Need for Speed – Undercover. Spotter Guides return for 2009! We are now planning our 2009 series of Spotter Guides. 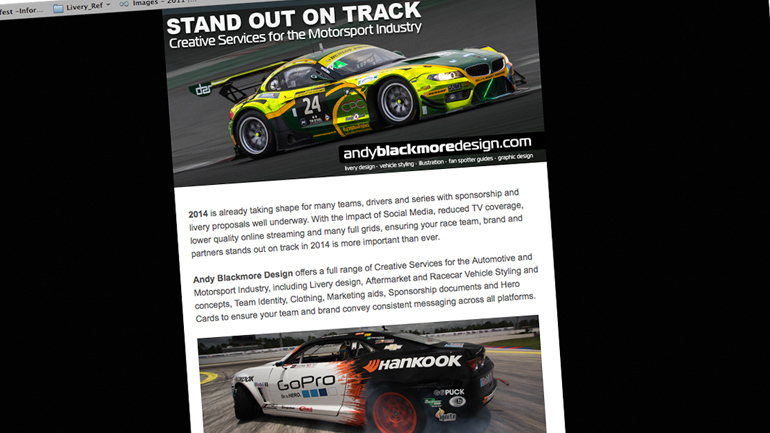 We plan on producing F1, ALMS and BTCC guides. 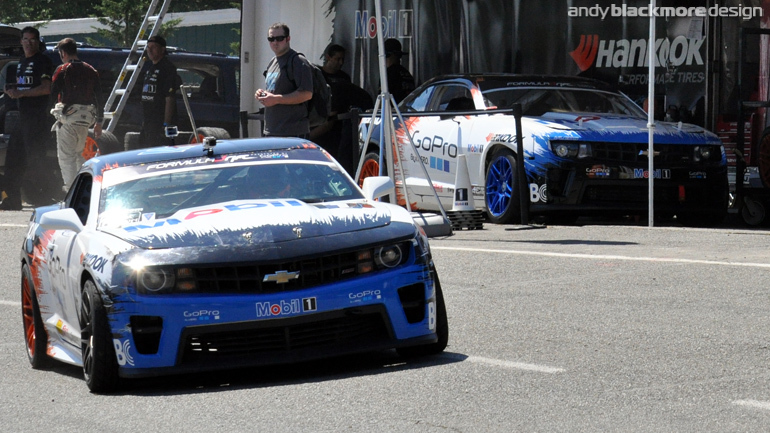 The American Le Mans Series will be using Andy’s guides online and at the circuit. You can view the 2008 Guides, here! SpeedTV.com carried an Interview with Andy during the ALMS finale weekend. The in-depth Interview, by Marshall Pruett, covers Andy’s career and future direction, now he is based in North America. The final Spotters Guide of 2008, for the final round of this years ALMS is now online. You can download this, and all our other Spotters Guides here!. 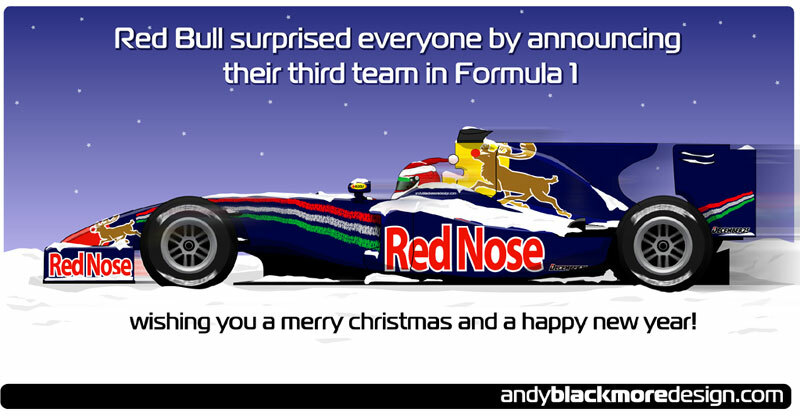 Andy’s designs remain in F1 for over a decade! Every year, F1 teams attempt to out-do each other in the pit lane with new pit equipment. McLaren started this trend back in the 90’s. It is therefore a credit to Andy Blackmore, that the pit crew helmets he designed for the 1998 Championship Winning Season and the overhead garage modules, introduced at the 1997 French GP are still in use, Eleven years on!. Andy was recently commissioned by Speed TV, to create an artist impression of the B-K Motorsports Lola Mazda coupe, which will appear later this year. The illustration and article has now appeared on countless forums and new sites as well as the official American Le Mans website. You can view the original article and image here. A larger version of the image can be viewed here. Speedhunters.com, a website dedicated to car culture has recently been launched. Andy is one of the contributors on the site, concentrating on circuit racing, rallying and design topics. You can read Andy’s topics HERE. A series of PDF Spotters Guides are now online as a free download HERE We have partnered with Ten-Tenths.com, SEATCupra.net, Radio Le Mans and DailySportscar.com. The guides will be updated during the season, keep checking the dedicated Spotter Guides site. Andy was comissioned to produced new car ‘Grid’ graphics for the 2008 BTCC coverage on ITV. The images are based of the BTCC Spotters Guide which you can download (see above). The ‘LeighRallying’ website of BTRDA Navigator and rally driver, Robert Leigh has been relaunched to reflect his 2008 Championship Campaign. 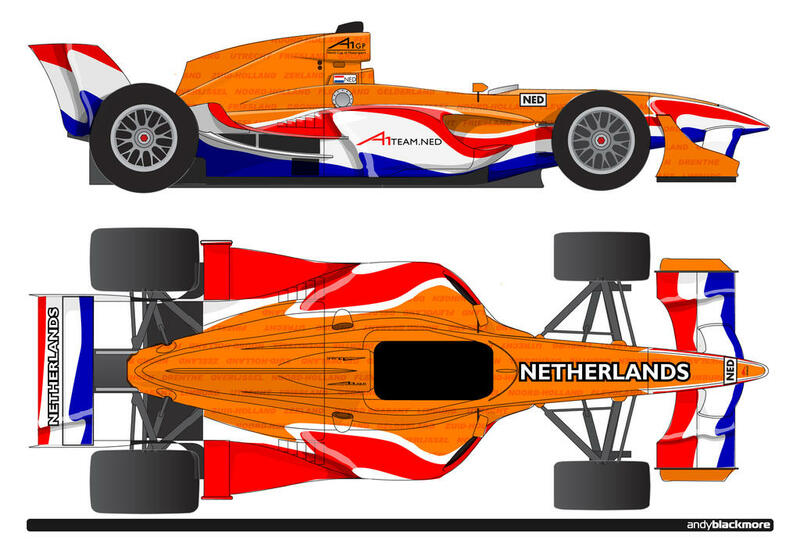 Earlier this year, Andy mocked up a quick livery for an A1GP Netherlands Livery competiton. The competition was open to Amateurs and Professionals and over 1000 entries were received. An online ‘fan’ vote of the 12 finalists resulted in 3rd place for Andy (The winner of this round doesnt actually meet the brief). Not bad for 2 hours work 🙂 You can view the design here. Andy’s McLaren F1 ‘Ueno Clinic’ livery voted favourite by the fans! The Black and Grey livery of 1995 Le Mans winner, Ueno Clinic McLaren F1 GTR was recently voted the favourite livery by fans in McLaren Automotive’s monthly online poll. Two of Andy’s other designs, 1995 Gulf and 1996 Fina also figured in the opinion poll. 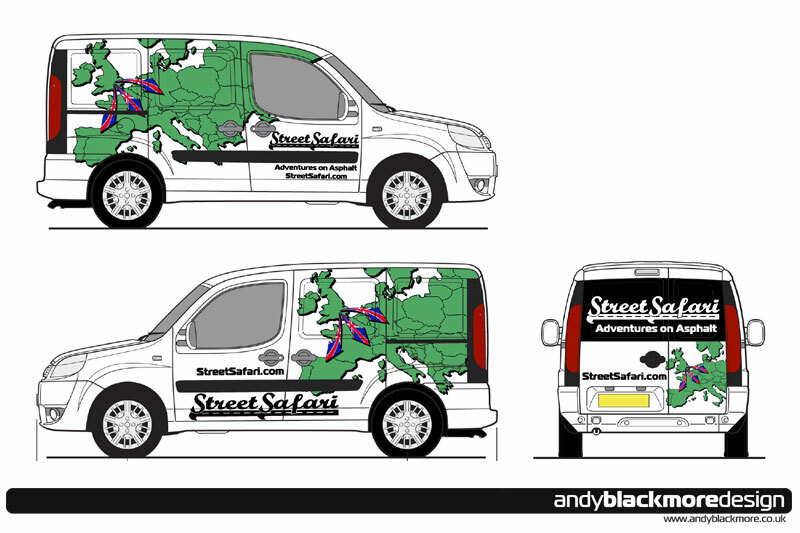 Visit the livery page for more of Andy’s liveries. Peugeot Cartoon makes print, web and t-shirts! A cartoon was produced as part of the team identity for Team Farecla recently. This has been used extensively. Its first appearance was on the new team website. The image was also used in the Donington BTCC programme. Just 36 hours later, it was utilised for a third time, printed on T-shirts, for fans and team personnel. Maximum usage!!! 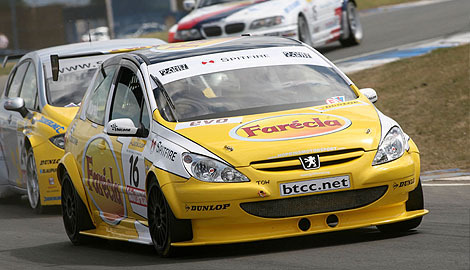 This makes a return to the championship for the Peugeot 307 BTCC car which Andy helped style with VLR in 2003. New LMP1 Coupe announced for 2010! 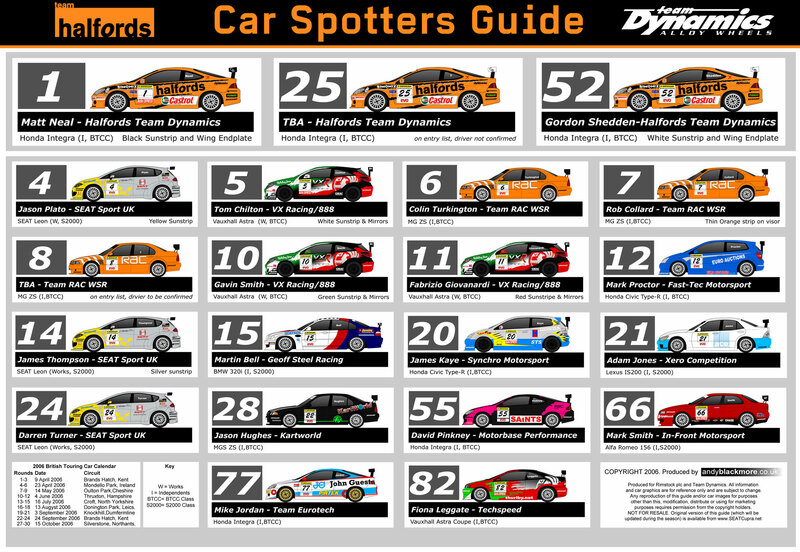 BTCC Champions, Team Dynamics use Spotters Guide! Thanks to support from SEATCupra.net and Ten-Tenths.com we are able to bring you a new Spotters Guide for the current British Touring Car and SEAT Cupra Championships. The pdf features side view drawings of each car/team/driver combination and will be updated during the season. The first of Andy’s 2006 car prints are now available and can often be found on Ebay. The first Champ car prints depict Sebastein Bourdais,Justin Wilson and Paul Tracy in their 2006 Machines. Other Champ Car prints will be available soon. Andy has also produced a F1 print with side views of all the Formula 1 teams. 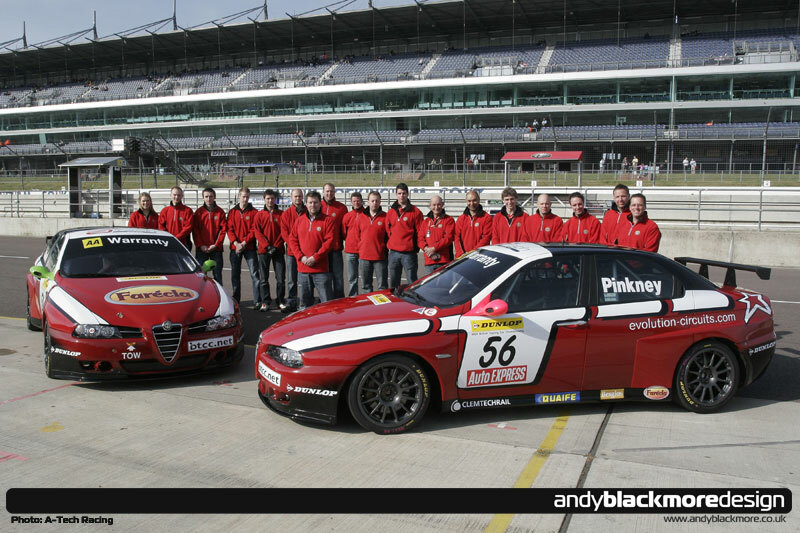 Two Andy Blackmore designed liveries continue into the 2006 Season. The Emotional Engineering Vauxhall Monaro GT recieved a tweak from Andy following sponsor changes while the ‘SAS International’ liveries which have appeared on the Porsche 996 Carrera GT3 has now been transferred onto the new 997 Carrera race car. 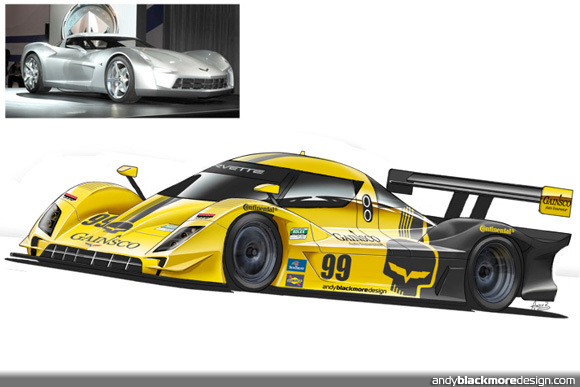 Andy has recently produced two artist impressions for Sportscar teams. Top LMES team Creation Motosport and KW Motorsport commissioned Andy to produced an artist impression of their 2006 car. This was published throughout the world. Andy also produced another drawing for the new Pro-Tran Team which was published in Autosport. Following the massive success of the 2005 Calendar, Andy was asked to create a 2006 Calendar for the UK Fiat 500 Club. The calendar was printed in the December issue of the club magazine and is also available as computer wallpaper. Andy’s Flintstone livery for the Rolling Stones Staples2Naples Rally team won the ‘Best livery award‘ with stiff competion from two other Andy Blackmore Designs. Just under a hundred cars entered the event. In asociation with SEATCupra.net, we are able to bring you a new Spotters Guide for the current British Touring Car and SEAT Cupra Championships. The pdf features side view drawings of each car/team/driver combination and will be updated during the season. 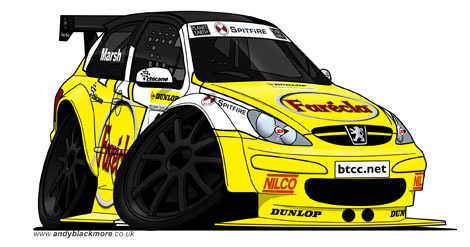 Andy was commissioned by Zytek Engineering and MG Rover to create an illustration of the MG ZS/Rover 75 DTM race car currently being desgned byZytek. The image was published worldwide and was also used for sponsorhsip proposals prior to MG Rover going into Administration in April 2006. British Rally driver, Gareth Jones made his debut in the British rally Championship in an Andy Blackmore liveried GadgetShop Renault Clio.